Yesterday, I wrote about the mounting persecution of Christians in the Middle East. But Satan's hate for God knows no bounds, and the growing hostility for Jews in Europe should be cause for great alarm. 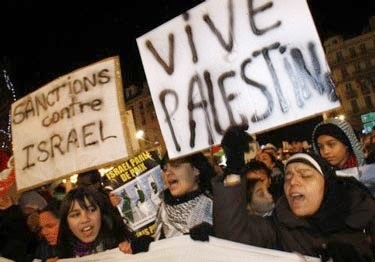 An Israeli newspaper, Haaretz, reports "The Israeli-Palestinian conflict has contributed to growing tensions between France's Muslim and Jewish populations, both of which are the largest in Europe. In the first three months of 2014 more Jews left France for Israel than at any other time since the Jewish state was created in 1948, with many citing rising anti-Semitism as a factor." Clashes with riot police and firebombs thrown at synagogues are becoming commonplace in the cities of France. A 17-year-old Jewish girl was sprayed in the face with pepper spray by a man described as "having a Middle Eastern appearance." The girl reported that her attacker shouted, "Dirty Jewess, inshallah you will die." Inshallah means "if Allah wills it" in English. Demonstrations against the hostilities in Gaza have grown more incendiary, with calls to "slaughter the Jews" and "Death to the Jews". No wonder Jews are leaving France in record numbers! After all, their grandparents (if they lived through the Holocaust) are probably warning them that this is eerily familiar territory. But France is not the only country in Europe that is exhibiting anti-Semitism. The newspaper, The Times of Israel, reports that "tens of thousands protested in London against Israel’s military operations in Gaza, denouncing Israel as a terrorist state and castigating British Prime Minister David Cameron for backing Israel’s right to self-defense against Hamas rocket fire." One protestor was heard to shout "from the river to the sea", a reference to the elimination of Israel. But equally alarming are the protests -- many of which are violent -- that have sprung up worldwide, including Cairo, Istanbul, Cape Town, Berlin, New York and Washington. Those who refuse to grant Israel the right to defend herself against the 1400 rockets fired by Hamas have escalated their rhetoric to new heights, calling for the genocide of the Jewish people. I know that this hatred has its roots in Satan's enmity towards God's "chosen people", but I simply cannot fathom the depth and breadth of this kind of hostility towards a people; any people. I am simply incapable of hating those who hate me that much; even those who hate me because of my faith. Yet, here we are again ... on the verge of an evil movement or philosophy or ideology -- call it what you want --- that threatens to once again come against a people whom the world decided were deserving of a land to call their own after 6,000,000 of them were exterminated. I don't know what God's plan is in all this; how, or if, or when He will defend the Jewish nation. But I do know that He will be involved in the outcome. Nothing happens without His authority. But I pray that the world does not repeat its treatment of the Jews, and I pray that they will review history and see how God has protected His nation thus far. And most of all, I wish the peoples of the world would read the Bible and see how this story plays out. There is no question as to who wins! Joel 3:17 "And Jerusalem shall be holy and strangers shall never again pass through it."